Ahoy mateys! 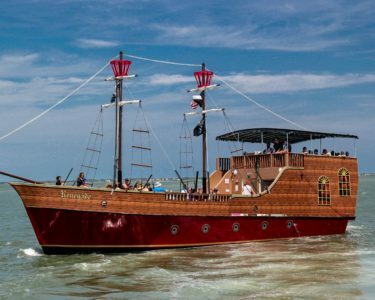 Welcome aboard Blackbeard’s Treasure Hunter! 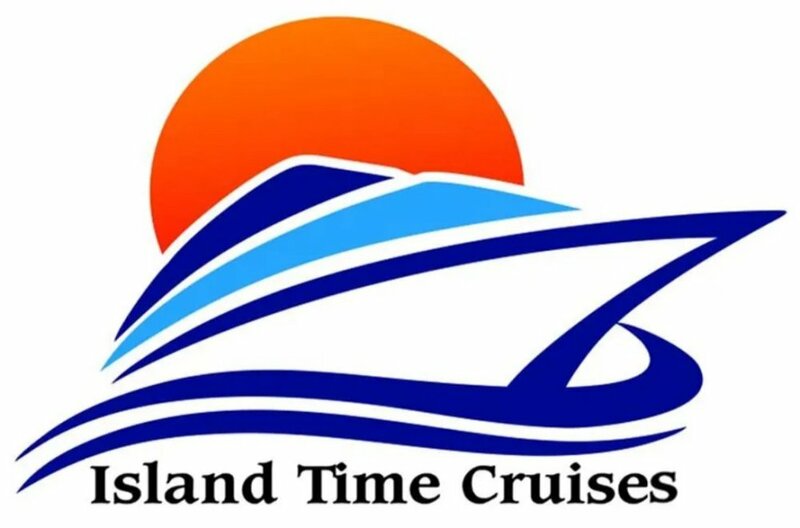 Book Directly With us for a Guaranteed Lowest Price. 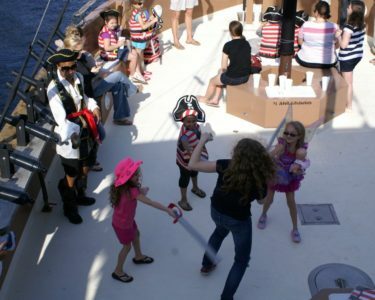 AHOY MATEY’S and welcome aboard the Carolina’s largest pirate ship, Blackbeard’s Treasure Hunter, for an hour long interactive family adventure that you and your family will never forget! 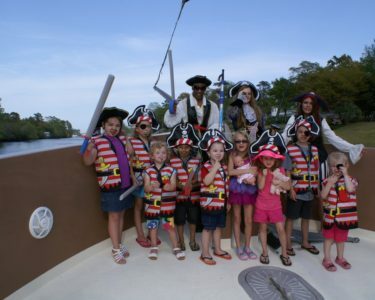 Our One Hour adventure begins on the dock, where we will transform your little mates into buccaneers, as our super friendly crew will give them a pirate mustache, pirate tattoo, and dress them like pirates. 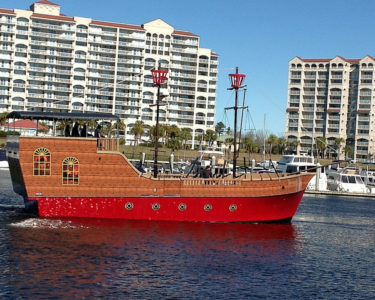 Once under way we will be on the lookout for Blackbeard’s Treasure. Aaaarrgghh! 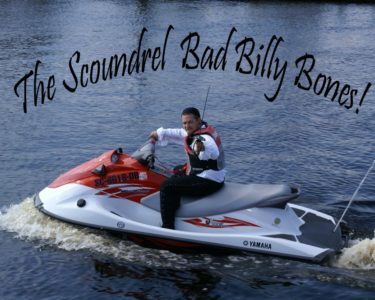 we will be havin’ some unwanted company, Bad Billy Bones (the dirty rotten scoundrel) is also hot on the trail of the lost treasure and has stolen the key to the treasure chest. 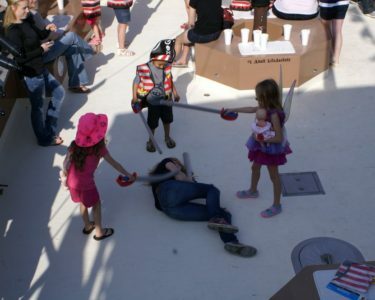 Our fearless pirate crew, along with your little buccaneers, must find the booty (treasure) before Bad Billy Bones & force him into surrendering the key (by any means necessary). 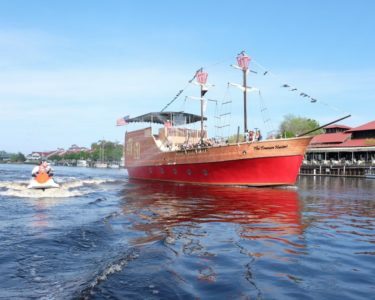 During the encounter with the scallywag Billy Bones, we will be firing the 16 high powered water cannons. 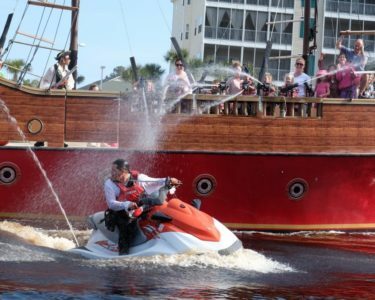 He has a water gun of his own that he will be firing back at us, shiver me timbers!, so prepare to get wet and have fun. 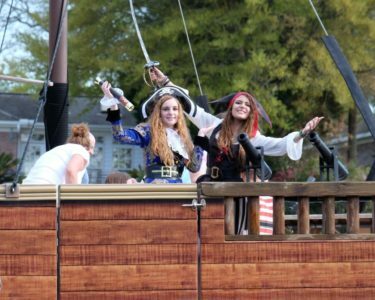 Once we defeat the enemy and capture the treasure, we will celebrate like the pirates we be. 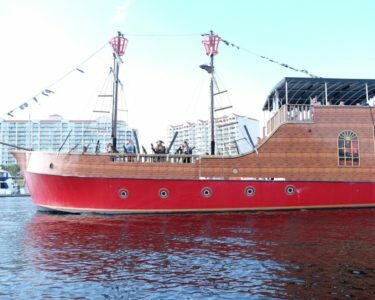 Yo ho ho we will raise the Jolly Roger (victory flag), sing & dance, play some games, open the treasure chest and all our buccaneers will share some of the booty. PLEASE arrive 30 minutes prior to departure so we can assure our crew will have time to get the kids transformed and our staff has time to get all you swabs together for a family photo!!! 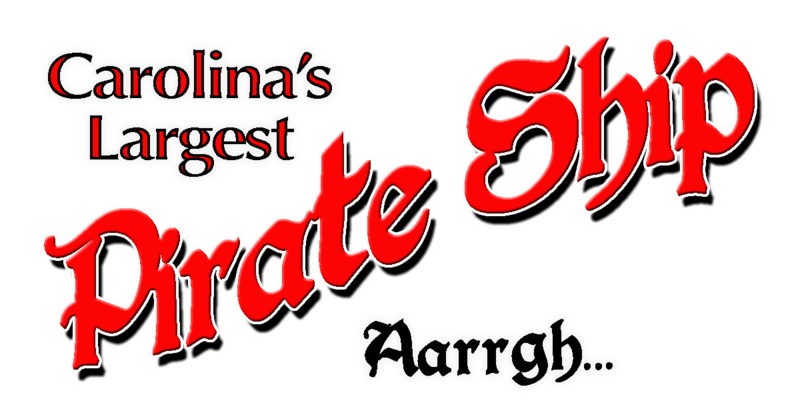 ARRRRRR! FREE! Each Swab will receive a pirate mustache, pirate tattoo, and whatever booty they earn. Pirates Are Not Afraid of the Rain! 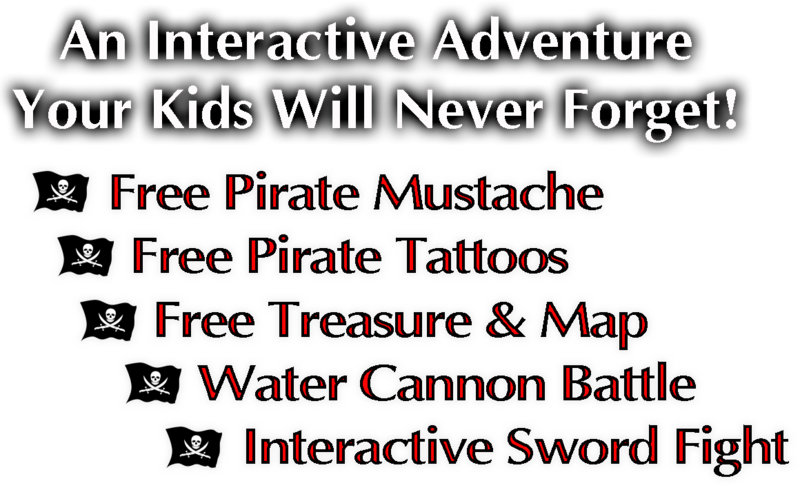 A fun-filled adventure with sword fights, singing, a chase on the high seas and water cannon battles for treasure. 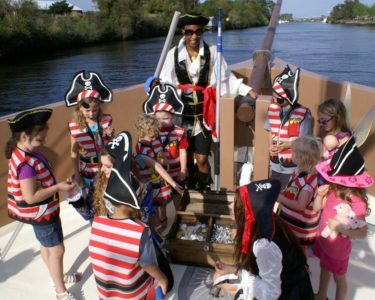 Custom charters for a variety of occasions and will work with you to accommodate your group event. Birthdays, School Groups, Church Groups, After School Programs, Youth Sports Teams, Family Reunions, Tour Groups, Corporate Outings, and Private Functions. 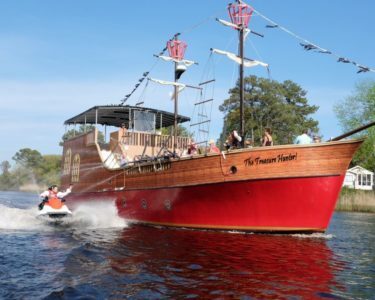 Privately charter the "Treasure Hunter" for larger events. Accommodations up to 70 passengers with ample seating. 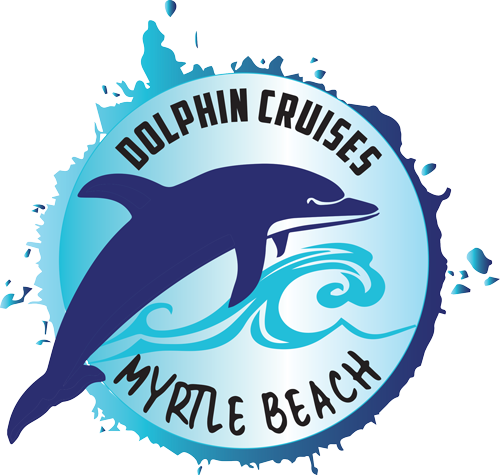 Reservations cannot be made or cancelled via email!